Color Play, day 2 | NJNA is Blogging! Today was a good day for stitching! We began with the background stitch which is a double running stitch that creates a hexagon design when completed. Three back and forth passes create the honeycomb. We worked a row across the top or bottom to create the frame work and will complete the background off of that section. The stitch is worked with a single strand of DMC Jewel Effects. The way that the light reflects off it makes a perfect simple background. We did start the last hexagon which will eventually use four different threads to complete it. Now it looks a bit like a smattering of mud on top. Once I established the design and completed the thread. 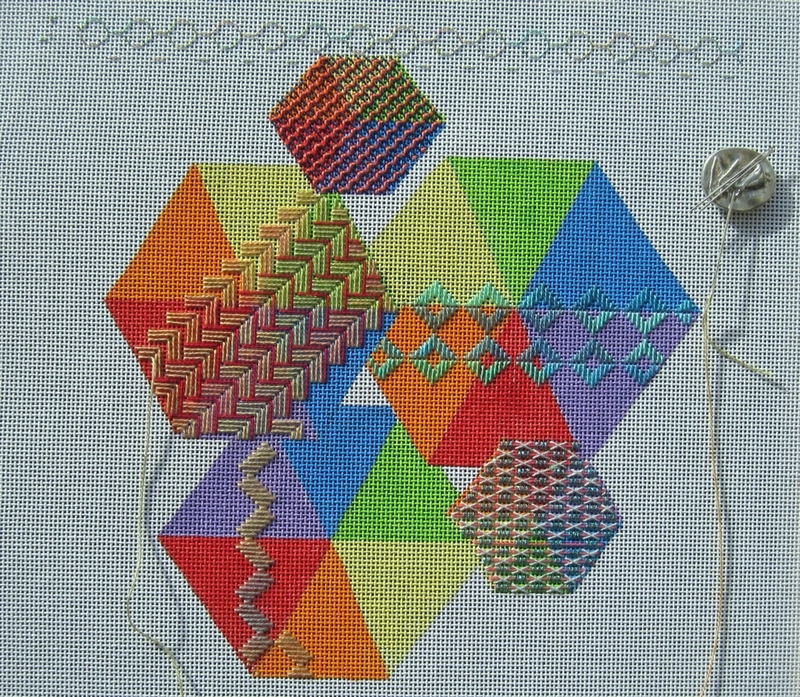 I returned to complete the two smaller hexagons and to work on one of the large ones. The addition of the red thread, only a single line in each pattern made all the difference. It was a fun class and oh what I learned!